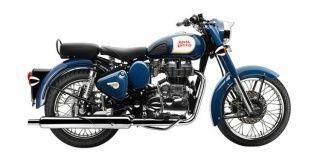 Royal Enfield Classic 350 price in Delhi starts from Rs. 1.39 lakh (Ex-showroom). Classic 350 is available in only 6 variant. Royal Enfield Classic 350 Redditch is priced at Rs. 1.49 lakh and the top-end variant Royal Enfield Classic 350 Signals Edition is priced at Rs. 1.64 lakh. Royal Enfield Classic 350's top competitors are Jawa Jawa (price starting at Rs. 1.64 lakh in Delhi) and Royal Enfield Bullet 350 (price starting at Rs. 1.21 lakh in Delhi). Q. What is the 1st service charge? Company gives first three services free. It means free of cost labour charges. But they will charge you engine oil, chain lubricant etc. it will cost you near about 1100/- to 1200/-.